Rotary Club of Exmouth Raleigh - welcome! Please scroll/swipe down through this page to find out more about us, in addition to the pages linked in the menu, top-left. 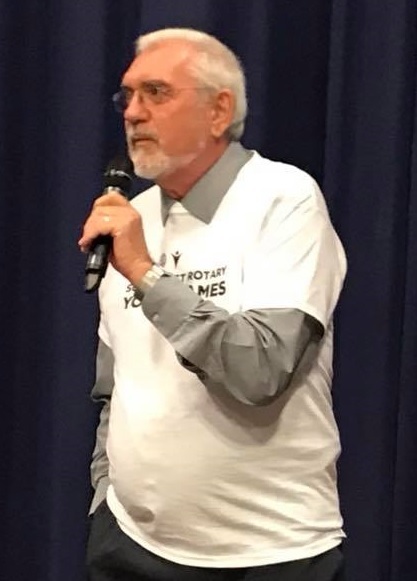 Devon's own Tom Daley shows how Rotary clubs worldwide are at the forefront of the fight to rid the world of this awful disease. We will be hosting a teddy parachute jump at The Strand on 27 May. Click the poster for more information. 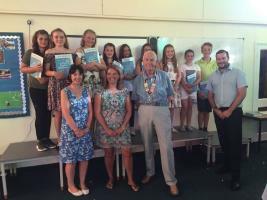 Copies of the Usborne Illustrated English Dictionary are presented to Year 6 students at the end of their last term in primary school. 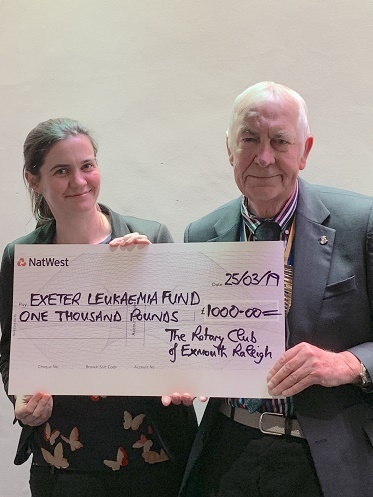 The activity is coordinated with the Exmouth & District Rotary Club to cover as many local primary schools as possible. Rotary makes a difference to so many lives, both locally in the Exmouth area, nationally and even worldwide. We are always on the lookout for new members. Maybe this poster will inspire you to contact us to find out more. Here's an introduction ... scroll further down for our latest news. Exmouth Raleigh is a small club of about 25 members, both men and women. We normally meet on a Monday evening for a meal, for companionship and to plan future activities. We always have a full programme of charitable and social events that take place throughout the year. We support local, national and international charities with emphasis on those in our area. We also support the global Rotary charity, the Rotary Foundation, which has been successful for many years with such initiatives as the "End Polio Now" programme. We are always ready to respond quickly to emergencies and natural disasters anywhere in the world. This response often takes the form of the funding of one or more Shelterboxes to provide much needed help to those directly affected. You will often see us on the streets of Exmouth doing our bit to improve the lives of people who are less fortunate than ourselves. 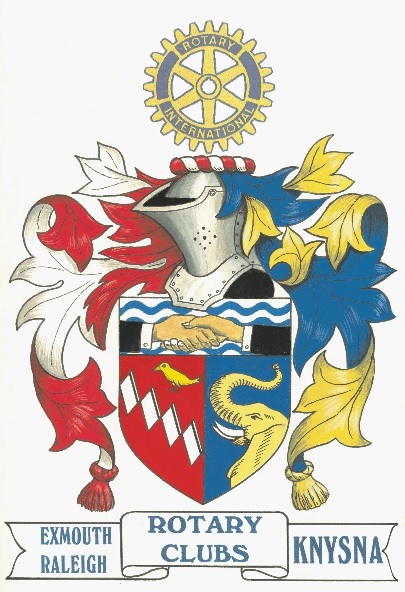 Whilst doing charitable work is both rewarding and commendable, companionship and fun are also important aspects of Rotary, so we usually have a dinner together on club evenings and hold a wide variety of social events for our members and their partners. In brief our members have great fun while supporting a huge range of charities and worthwhile causes. If you would like to learn more about us, please use the "Contact" link at the bottom of this page. 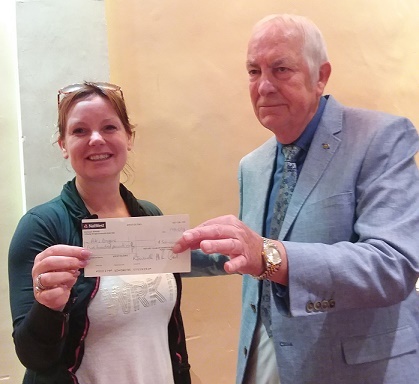 President Stewart presenting a cheque for £1000 to Natalie Searle of ELF (March 2019). President Stewart presenting a cheque for £500 to Alison Jordan of Pete's Dragons. See their web site at http://www.petesdragons.org.uk/. Pete's Dragons was set up by Alison, following the loss of her brother, to give support to those who have experienced bereavement through suicide. The demand for the charity’s services is growing fast and Raleigh Rotarians were delighted to be able to fund the specialist training of two new members of staff. We have a long relationship with our twin club in Knysna, South Africa. An ex-member of Raleigh moved to South Africa and joined this club and a group of our members visited them a few years ago. 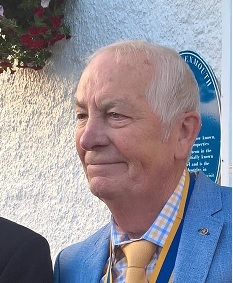 ... served as District Governor of Rotary clubs in Devon and Cornwall for the year 2017/18.